Weary and discouraged from a difficult, seemingly endless journey, you may have a heavy heart from life’s challenges. Your trek sometimes leads you through a dark, lonely tunnel, littered with obstacles and disappointments. But you persevere. You scratch, claw and crawl, always forward. Because you are a Warrior. 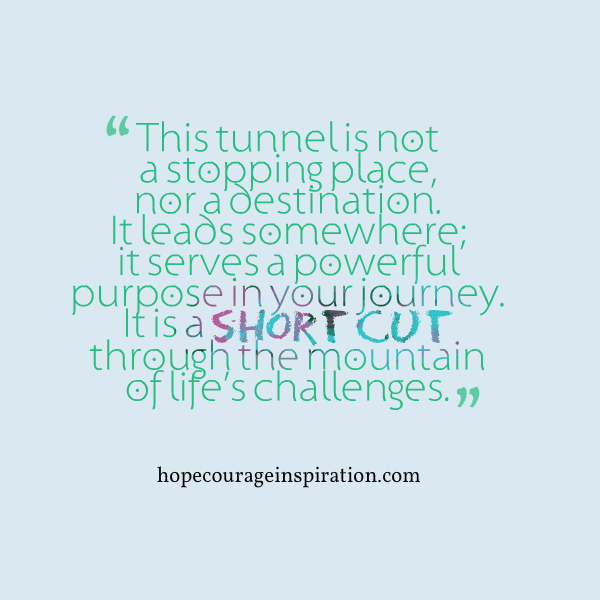 Every tunnel ends in a ray of hope, a promise of reprieve and hope for a better tomorrow. Yet, it’s only in the darkness that you can truly appreciate the powerful opportunities that light brings. Search for the tiniest of blessings in the dark; the most simple joys and small moments of gratitude have the power to shed just enough light for you to take a step forward. And another. Then another. Although it can be difficult to look up, life is more than the ground at our feet, more than any tunnel that seemingly confines us. You can choose to see beauty and hope, even in the darkest of circumstances. Make that choice today and let the smallest moments of joy light your way forward through the tunnel.